Asia Ingalls’ big, bold pendant is a pretty reminder to follow your heart. Your brain gets a lot of credit. Always thinkin'. So practical! But every now and then, it's OK to put a little faith in your heart. 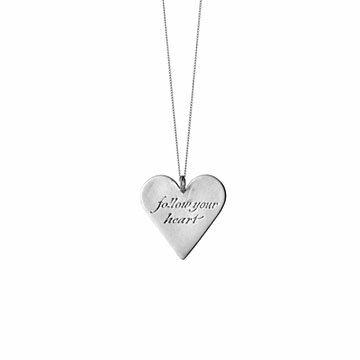 Asia Ingalls' extra-large, recycled sterling silver pendant is engraved with a bold reminder: follow your heart. Whether you wear it with the message toward you (a private mantra) or as a statement to encourage everyone you meet, it's a beautiful way to embrace your carefree side. Handmade in New York City. Pendant: 1.6" L x 1.6" W Chain: 18"